Mopeds are a type of low-powered motorcycle designed to provide economical and relatively safe transport with minimal licensing requirements. Mopeds were once all equipped with bicycle-like pedals (the source of the term, motor-pedal), but moped has been increasingly applied by governments to vehicles without pedals, based on their restricted engine displacement, speed, and/or power output. 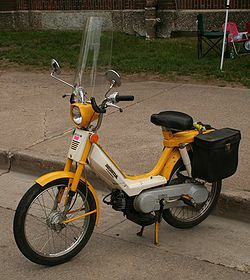 Mopeds occasionally resemble powered bicycles, but most are now step-through designs (of both kinds, having either large or small wheels) and step-over designs similar to a regular motorcycle. Although mopeds usually have two wheels, in some jurisdictions low-powered three or four wheeled vehicles are also classified as mopeds. In most countries, the legal driving age for a moped is lower than for regular motorcycles and cars. Mopeds are typically restricted to 50km/h from a maximum engine displacement of 49cc, though there are a few variations. 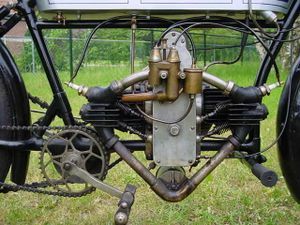 The term "moped" now only applies to low power (often super-economy) vehicles, but pedals were a sign of sophistication when first fitted to the early motorcycles, such as the 1912 Douglas in the photograph. Pedaling away from stationary was a great improvement over "run and jump" and LPA (light pedal assistance) was valuable for climbing hills. Better transmissions with wider ranges, better clutches and much better engine performance made pedals obsolete on all serious motorcycles by 1918 but the pedals on mopeds remained valuable for their original purposes as late as the 1960s. A more innovative design was known in the UK as the Cyclemaster. 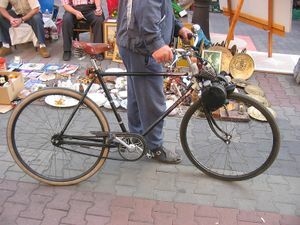 This had a complete powered rear wheel which was simply substituted for the bicycle rear wheel, which originated from a design by two DKW engineers in Germany. Slightly larger machines, commonly with a 98cc engine were known as autocycles. On the other hand some mopeds, such as the Czech-made Jawa, were derived from motorcycles. 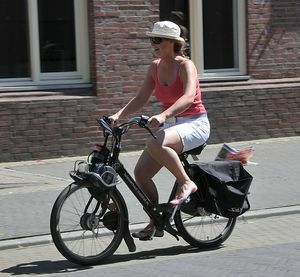 A further category of low-powered two-wheelers exists today in some jurisdictions for bicycles with helper motors – these are often defined as power-assisted bicycles or motorized bicycles; see full article there. Other jurisdictions may categorize the same machines as mopeds, creating a certain amount of confusion. In many countries three wheelers and microcars are classified as mopeds or variations thereof. This practice is not restricted to the third-world, France and Belgium classify microcars such as the Aixam similarly or as "light quadricycles". The word moped was coined by Swedish journalist Harald Nielsen in 1952, as a portmanteau of motor and pedal. It is however often claimed to be derived from "motorvelociped", as Velocipede is an obsolete term for bicycle that is still being used in some languages such as Russian. According to Douglas Harper, the Swedish terms originated from "(trampcykel med) mo(tor och) ped(aler)", which means "pedal cycle with engine and pedals" (the earliest versions had auxiliary pedals). By the 1980s, it was obvious that the pedals on mopeds were no longer performing any useful function, in fact the performance of the 49cc engines available was delivering speeds in excess of 80km/h, a common model in the UK being the Yamaha FS1E. Due to emerging safety concerns that resulted from the considerably greater speeds that newer mopeds were capable of reaching, western jurisdictions introduced new regulations (eg UK in 1977)Yamaha FS1E Classic Bike Pictures, limiting the speed of these "mopeds" to 30mph (and abolishing the requirement for pedals). In some cases, the power restrictions (such as perforated plates in the inlet tract) were primitive and easy to bypass, but the larger manufacturers such as those from Japan restricted engine breathing with smaller carburetors (eg 16mm replaced with 13mm) and modifications to cylinder ports and exhausts. Then they fitted CDI ignition systems tuned to limit maximum engine revolutions; the Honda MT/MB50 was built to run to 10,000 rpm, but the combined restrictions cause it to run out at around 6,500 rpm. Illegal de-restriction of such models is extremely difficult, requiring replacement of piston, barrel, carburetor and CDI electrics, and possibly the crankshaft and the exhaust as well. Safely riding a moped mostly requires the same considerations as safely riding a motorcycle but the lower speeds, while reducing some dangers, increases others. The biggest danger is that other traffic may not notice the presence of a moped - bright clothes and reflective fittings help. Drivers may even see the moped, recognize it as harmless to them and simply forget it's there, pulling out of side-turnings into its path. Similarly, a car approaching a moped from behind will approach it more quickly than the driver expects, and the driver's attention may be more attuned to other automobile traffic rather than the moped, increasing the likelihood of an accident. This is a particular problem for mopeds used on high-speed roads where they may not be intended to travel. Even as mopeds themselves have become scarcer in the West, a certain nostalgia has grown around them (as with classic scooters). Enthusiasts have formed a considerable number of organizations devoted to moped collecting, repair, and lifestyle. ↑ Legislation. Aixam.com. Retrieved on 2009-03-31. ↑ Moped - inget teleskopord (Swedish). Dagens Nyheter (2006-01-15). Retrieved on 2007-06-01. ↑ Harper, Douglas (November 2001). Moped. Online Etymology Dictionary. Retrieved on 2007-01-09. ↑ Moped Survival Guide—Urban Two-Wheeled Warfare. Moped Army. Retrieved on 2007-06-01. This page was last edited on 26 November 2010, at 22:37.